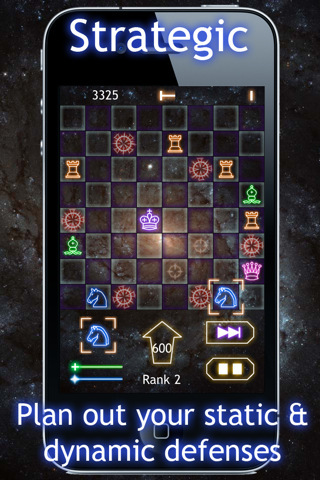 Knight Defense is a strategy tower defense game for iPhone and iPod touch fused fantastically with chess. Yes, chess. Each chess piece becomes the towers and you are allowed to make as many moves as you’d like to fend off against swarms of enemies that will not be taking turns. Knight Defense sells for $0.99 in the App Store. So what does chess have to do with a strategy defense game? Well, take each piece and keep their standard mode of attacking and moving. Pawns can only move one space, knights can jump in an L shaped path and hop over other units, bishops move diagonally, and etc. Enemies spawn from specific points on the field and they will always go straight for your king regardless of what’s in their way. This is very important to get across because I made the mistake of thinking my pawns could lead the enemy units into a little U-shaped trap to get rid of them. Nope, they just smashed through my units and bee-lined towards my king. Strategy comes from what your units can actually do to the enemy and some maps require you move your units around just to keep your strategy alive. You can double tap your units to activate their own individual powers. Your king will shield nearby units to create an invincible wall for a few seconds, pawns will trap enemies in place for a short duration, and queen can deal crazy damage to every enemy unit on the field! You can also upgrade each of your units to increase their health and really boost their attack strength too. Another change to the classic chess rules is that you can freely move your units at any time during or between enemy waves. This allows you to set up a stronger defense, move the king further away from the spawn points or make room for your new pieces. So the art direction is pretty much neon-shapes on a dark background. I can’t explain why but softly glowing neon colors are very pleasing to the eyes. The chess theme fused perfectly with the strategy defense genre with each unit class having instantly recognizable shapes (for those of us who played chess) while also making it completely fresh and unique. The style really does look like Geometry Wars or GeoDefense but still fresh and a standout. I thoroughly enjoyed Knight Defense because of its spectacular handling of this genre fusion and its clever chess piece powers. The game could make use of some different terrain rather than just a simple chess board, but this is Chess… hard to complain about accurate re-imaginings. 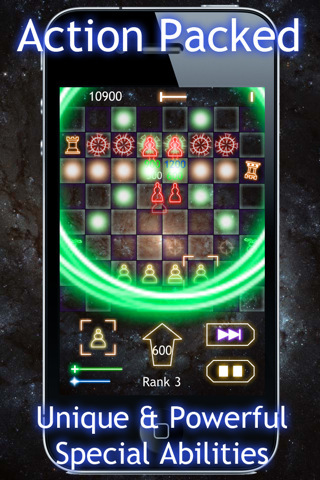 AppSafari review of Knight Defense was written by Joseph Ho on October 21st, 2011 and categorized under App Store, Board, Featured, Games, Resource Management, Strategy, Tower Defense. Page viewed 3895 times, 2 so far today. Need help on using these apps? Please read the Help Page.